Indonesia was one of the six countries who signed the MEFIN Declaration of May 2013 (also known as Cebu Declaration) and signified support to the promotion of inclusive insurance as a strategy for poverty reduction in the region. In January 2016, Indonesia renewed its commitment to the MEFIN Network which was then formalized as a regional platform for peer-to-peer exchange of knowledge and experiences in inclusive insurance. 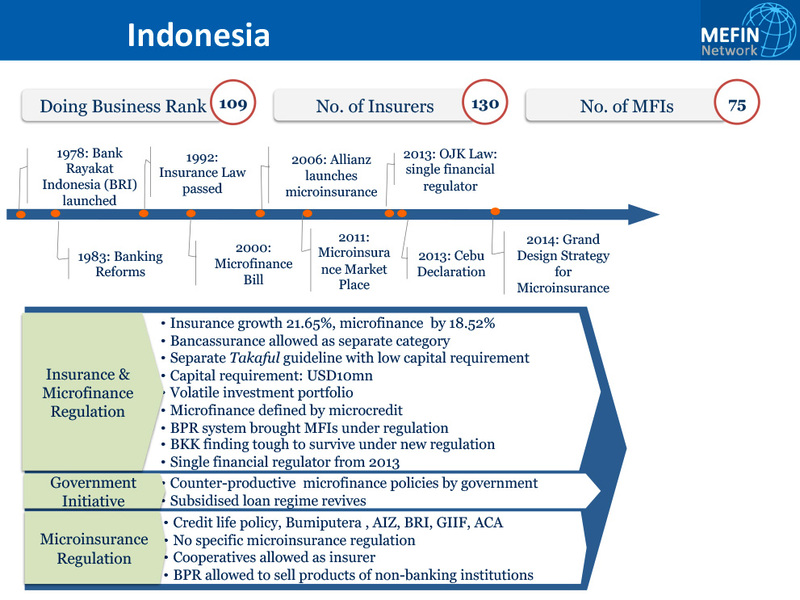 In recent years, the Indonesian insurance market has attracted significant interest from international investors, both in terms of its M&A and bancassurance opportunities. While still a relatively small market by overall size, it is forecast to grow rapidly, driven by an expanding middle class and current low penetration rates. From 1 January 2013 Otoritas Jasa Keuangan (OJK) assumed the role of industry regulator from Bapepam–LK. The change was driven by the desire to create an independent ‘super regulator’ to supervise the banking and insurance sectors of the country. Reported signs of increased efficiency in the OJK is hoped to attract further foreign investments. Indonesia is the largest island country in the world by the number of islands, with more than 14,000 islands. With an estimated population of 255 million people, it is the also the world’s most populous country. Indonesia is a founding member of the Association of Southeast Asian Nations (ASEAN) and a member of the G-20 major economies. Its economy is the world’s 16th largest by nominal GDP and the 8th largest by GDP at PPP. Indonesia's Gini ratio, the coefficient that measures inequality among income distribution, lies at 35.6 and the HDI at 0.684.